To evolve is to live in a constant state of learning, often chameleonic and with detours off the path you first set out to conquer. Emcee N.I.C.E., a veteran Hip Hop artist, producer, writer and all-around creative, has been climbing a long and winding ladder of musical leadership that’s included collaborations with rap icons NAS and 2Pac (posthumously), a song on the soundtrack Academy Award-winning film “Crash,” and a cover of a Prince song, enthusiastically approved by The Artist himself. Yet all along, the impact N.I.C.E. has been grinding hardest to achieve is as a man with uplifting messages of love, optimism and Christian inspiration tailor made to change the lives of urban youth that need them the most. N.I.C.E.’s path has triumphantly led to the independent chart-topping success of his 1st single “I Got Angels” and debut album, PRAISE – faith-fortified message music bonded with the street heat of urban pop’s hottest hits and, most importantly, powerful metaphorical lyrics kicked by a wise young brother who has lived, strived and studied that of which he speaks. Plus, as an author as well as co-creator of the urban animated series “Da Jammies,” the first black animated music series for kids on Netflix, N.I.C.E. knows no creative limits. His name as a performer was originally Novelist. Today, his acronym N.I.C.E. stands for Novelist Is Constantly Evolving. Emcee N.I.C.E. defines his 14-song album, as “a celebration of Christ with a blend of scripture and creative metaphors that give the listener spiritual food for thought.” The lead single, “I Got Angels,” (I Got Angels) soars on a sample of “Angels” by Gospel Hall of Famer Richard Smallwood who endorses N.I.C.E.’s song 100%, enthusing, “It will go places that I never could have envisioned…that’s just how God is.” Anchored by Sam Peezy’s Trap-inspired beat, N.I.C.E. kicks a bold opening statement, in a song assuring that no matter how hard the devil tries to sabotage us, angels keep us out of harm’s way. On his first-time introduction in gospel music, with his debut album “Praise” and single “I Got Angels” he became a four-time #1 Billboard Inspirational Hip Hop Gospel star by chart-topping Billboard sales and airplay as the #1 Top Gospel Albums, #1 Gospel Album Sales, #1 Hot Single Sales, and #1 Digital Song Sales. Finding his own voice as a solo hip-hop gospel rapper has garnered Emcee N.I.C.E., an all-around creative, much success as a new face in inspirational gospel music. His second single titled “Alright” (featuring Stripped, Rahkua & The Georgia All Stars), topped the charts at #1 on the Nielsen Top 100 Soundscan Sales Charts. Emcee N.I.C.E. releases his highly anticipated collaboration with Gospel Legend and Icon Fred Hammond “Glory to God”, inspired by Fred Hammond’s “Glory to Glory”. The song is about being unashamed to give God the glory and praise, as Emcee N.I.C.E. continues to fuse scripture, praise, and rumbling drums produced by Sam Peezy. As amazing as the songs, the emergence of Emcee N.I.C.E. on multiple charts measuring independent albums, Christian songs, R&B/Hip-Hop albums, and emerging and current artists has placed him in rare air as a notable trailblazer coming from secular to gospel music. Emcee N.I.C.E. turned loose a boutique unorthodox marketing team that devised a “digital street team strategy” combined with grassroots analytics and a robust database to propel his music and brand, connecting directly to the culture and influencers. Music, Ministry, and Message are at the heart of Emcee N.I.C.E.’s divinely inspired artistry - the hallmarks of a life and career steeped in purpose and service. Emcee N.I.C.E. - Youtube Def Poetry - "Reclaim"
EmceeNICE » YouTube » Emcee N.I.C.E. 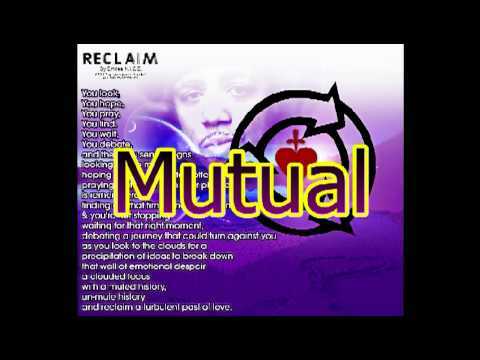 - Youtube Def Poetry - "Reclaim"